A Westport reusable bag. Westport was the first town in Connecticut to pass a plastic bag ordinance in 2008. Taken Nov. 5. 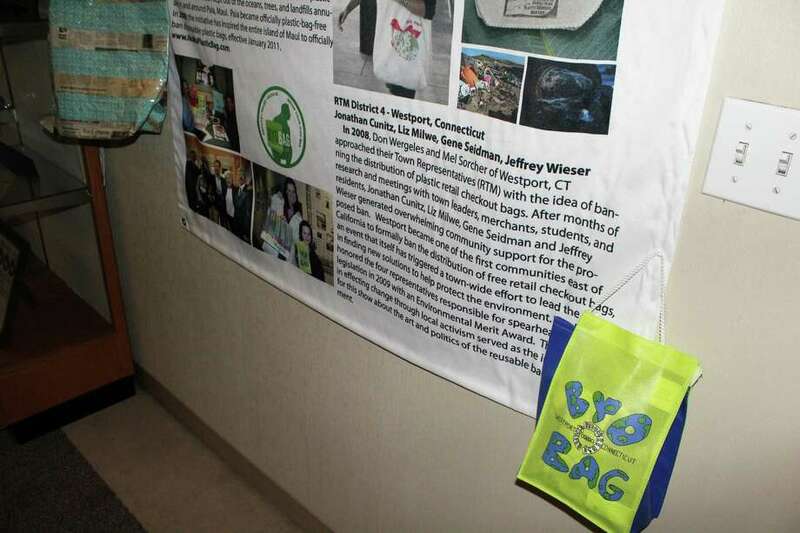 WESTPORT — State Sen. Will Haskell and state Rep. Jonathan Steinberg, both D-Westport, will join members of the Reusable Bag Alliance on Saturday at 1 p.m. at Compo Beach to discuss their proposed bills that would ban single-use plastic bags across the state. The effort to ban plastic bags is part of a growing national movement aimed at raising awareness about the effects of plastic on the environment and marine life. Westport led the way a decade ago, becoming the first town east of the Mississippi River to ban plastic bags. Within the past few months, neighboring towns have enacted similar laws, including Norwalk, Stamford and Greenwich. Other municipalities — Darien, Fairfield, New Haven, Hamden, Branford, Guilford and North Branford, among others — are in dicussions about bans. Senate Bill No. 236, “An Act Prohibiting the Use and Distribution of Plastic Single-Use Bags,” introduced by Haskell, would prevent retail businesses from using those bags in packaging their products with the stated purpose of protecting the state’s natural environment. House Bill No. 6433, “An Act Prohibiting the Use of Disposable Single-Use Plastic Bags and Promoting the Use of Reusable Bags,” introduced Steinberg, would do the same, also promoting reusable bags to shift consumer behavior. A third piece of legislation, House Bill No. 6256, “An Act Concerning Single-Use, Plastic Bags,” introduced by state Rep. Kim Rose of Milford, would ban single-use plastic bags and require a 15-cent fee on paper and reusable bags. In the event of rain or snow, the event will be rescheduled for Sunday.